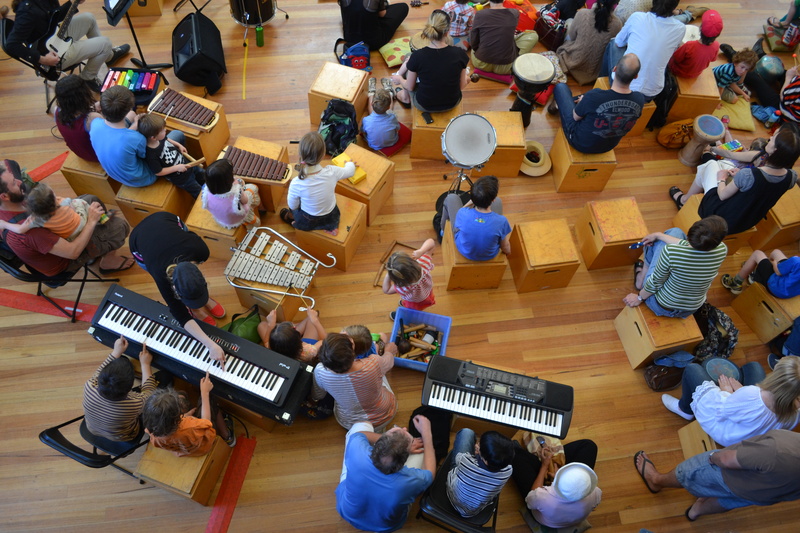 This weekend I am leading a series of free workshops at ArtPlay on behalf of ArtPlay and the Melbourne Symphony Orchestra [MSO] for children aged 8-13. The workshops are held at the start of every school year and we always get a pretty strong showing of participants – with 5 workshops across the weekend fully booked, or close to full. 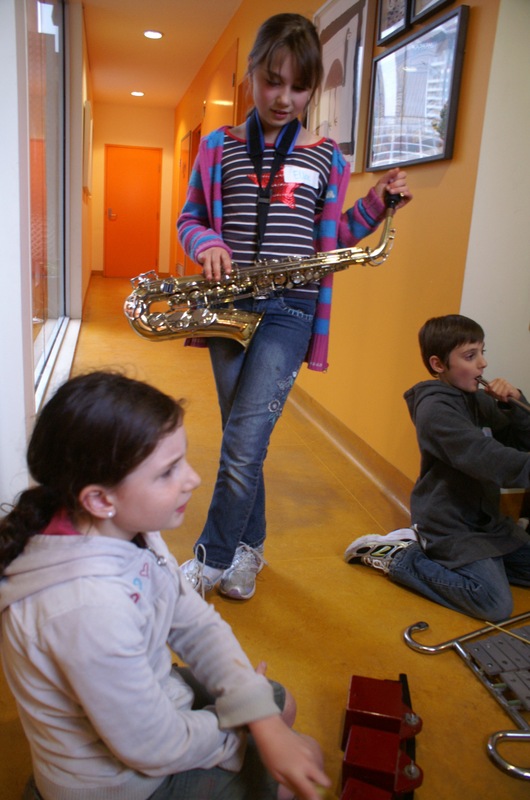 Children come with their instruments and take part in a fast-paced 1-hour composing workshop. At the end of the hour we perform the newly composed pieces of music to an audience of their parents and siblings. The workshops are a fun experience in themselves but they also function as a ‘taster’ session of what is on offer in the year-long MSO ArtPlay Ensemble program, and we use them as a kind of audition, enabling us to identify which children most strongly responded to the open-ended, creative and collaborative way that we work. 25 of these children are then offered a place in the year-long program. Fully-booked workshops means no obvious barriers to participation, presumably? Not necessarily. Every year, we approach this program strongly aware that simply by virtue of it being a music program, it is going to attract the attention of a certain demographic – those whose children are learning to play an instrument, and to a lesser extent, those who regularly participate in creative arts workshops in centers like ArtPlay and who prioritise those experiences, but who may not been involved in learning to play an instrument. 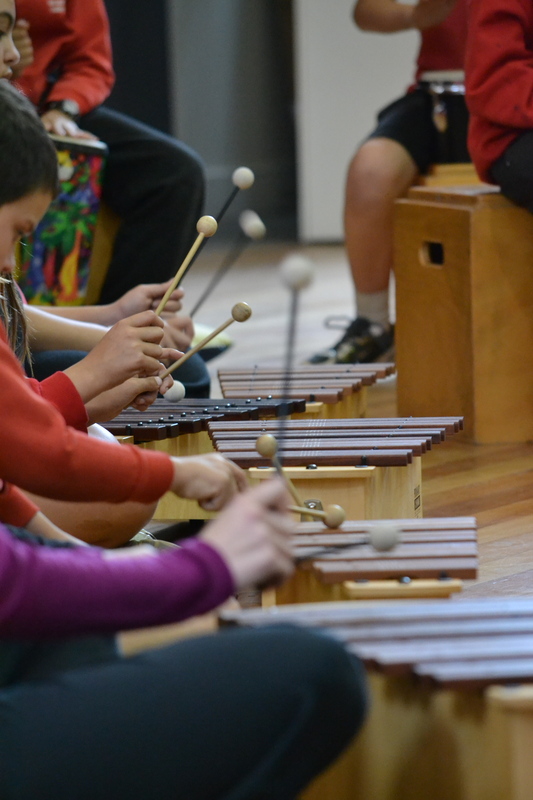 In Australia, learning to play an instrument is an expensive undertaking, rarely offered at primary schools without passing the cost of the lessons and instruments on to the parents. 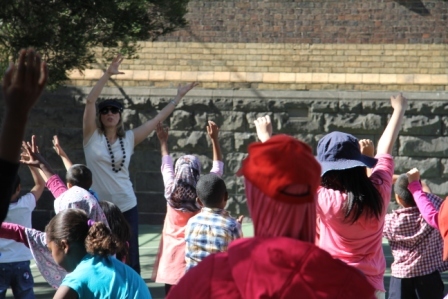 Every year therefore, I consider the projects I have led in disadvantaged schools and try and identify particular children that I know would thrive in a program like this – children who demonstrate musical talent and vibrant creative imaginations. There are a small number of scholarships (ie. fully-subsidised places in the year-long program) available for children who might not be able to accept an offered place due to financial constraints. But there are many reasons children may not take part in programs like this and they are not all financial. Children of this age-group generally need a parent or adult to accompany them to the workshop venue and to pick them up, but in some households this is a huge barrier because parents are working, or caring for younger children, or don’t have transport options, or can’t afford public transport… or they may not assume that kind of involvement in their children’s lives and rarely take them anywhere. Similarly, they might make a plan for their child’s travel to and from the venue, but when the workshop day comes, decide they need that child to stay at home that day – there are other things that take priority over the workshop in their family. There may also be psychological barriers about going to a new, unfamiliar place (for the child and the parent). 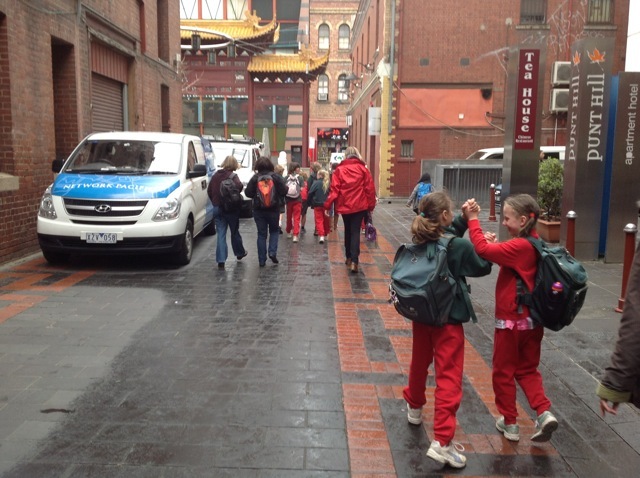 The venues for the MSO ArtPlay Ensemble are all in the city centre – but many families (especially those who are new to Australia, or from refugee backgrounds as are many of the children I work with) may find the idea of going into the city centre quite intimidating and even frightening, as it is unfamiliar, busy, and perhaps unpredictable. Similarly, buildings can be psychologically intimidating places to enter, even if they are ‘public’ spaces. 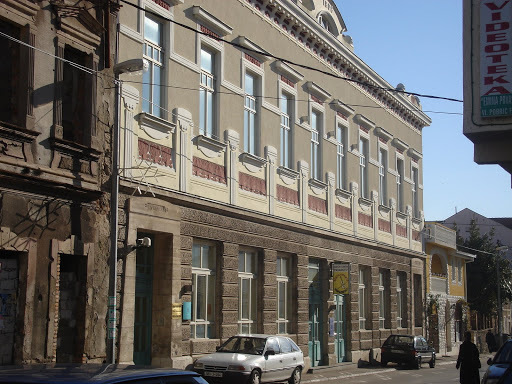 People may instinctively sense that they are “not welcome”, or that this place is “not for their type”, and therefore reluctant to cross the threshold. As an artist or arts worker in participatory projects like workshops, these barriers can be very tricky to overcome. With the MSO ArtPlay Ensemble, we have tried a number of ways to encourage a more diverse group of participants into the program. One year, I identified a talented young Vietnamese girl, recently arrived in Australia, as someone who would benefit from and contribute lots to the Ensemble. She lived quite far from the city so we arranged for her to travel in a taxi to and from the workshop venue each day, in addition to offering the fully-subsidised place. Sometimes an older cousin travelled with her, and by about the 3rd workshop in the year, they had decided that May would travel home on the train by herself. Her cousin had shown her how to get to the station. She also asked me if I could accompany May to the station at the end of the workshop, but I had a meeting with the orchestral management team immediately after the workshop, so they decided that May could go by herself rather than wait. About 40 minutes into my meeting that afternoon, the receptionist came to find me, to ask me to go to the front desk. May was there, sobbing and sobbing, in quite a state. She had tried to go to the station but had got lost. She’d come back to the workshop venue to find me (the only person she knew) but I couldn’t be located by the security staff because I was in this meeting. May felt overwhelmed by the entire situation (and perhaps by the effort of trying to make herself understood in English) and began to cry. Of course at that point I stayed with her, and travelled home with her, but after that day, she didn’t return to the program. I spoke to her cousin on the phone who told me she didn’t want to come back. That was at the end of last year, December 2012. I no longer teach at that school, and so when the school term resumed this week, I got in touch with the school to see if I could get a message to the family to remind them about the workshops this weekend. I had given the mother my phone number and all the information about the program the previous year, but I hoped to give an additional reminder. The school is not legally allowed to give me the family’s contact details, but they first mentioned the music opportunity to the children’s father one day and suggested he or his wife should contact me. He apparently looked at the message-giver rather blankly! So the next day, the principal approached the older of the two children with a note for their mum, asking her to call me about the music opportunity and giving her my number. That was on Thursday. She didn’t call. My other idea had been to try and get to the school at either drop-off or pick-up time to see if I could catch up with the mum there, but my work schedule didn’t allow that on Friday. In any case, I began to wonder if I was pushing something at them that they didn’t want to do. I thought about all the barriers that that might be stopping mum from calling me (such as no phone credit, or feeling unconfident speaking to me on the phone in English, or not wanting to say ‘No’ outright to me). But I also thought about how I would love for those two children to have the experience of going into ArtPlay, being greeted so warmly by the staff there, meeting the MSO musicians, playing music with me in this different context, feeling the thrill of being in such a beautiful space, purpose-built for art-making and young imaginations… and then after the workshop playing in the playground and feeling excited by what they had achieved and experienced. Who knows, perhaps she has already registered the children for the workshops this weekend! I’ll find out when I get there I suppose. And if not this year, maybe I will be able to encourage them to come along next year. And if not them, someone else. How do we know what children have learned? Back in August I blogged about a forum for artists, educators, and arts organisations that took place in Melbourne with Arnie Aprill from the Chicago Arts Partnership in Education. 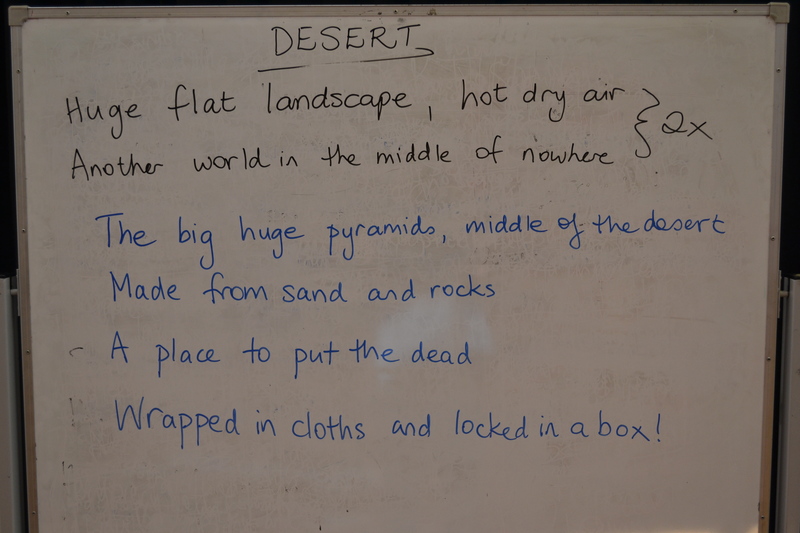 One of the discussion topics was documentation and the importance of using the video documentation to record what is being learned by students when they engage in open-ended, contemporary arts collaborations. 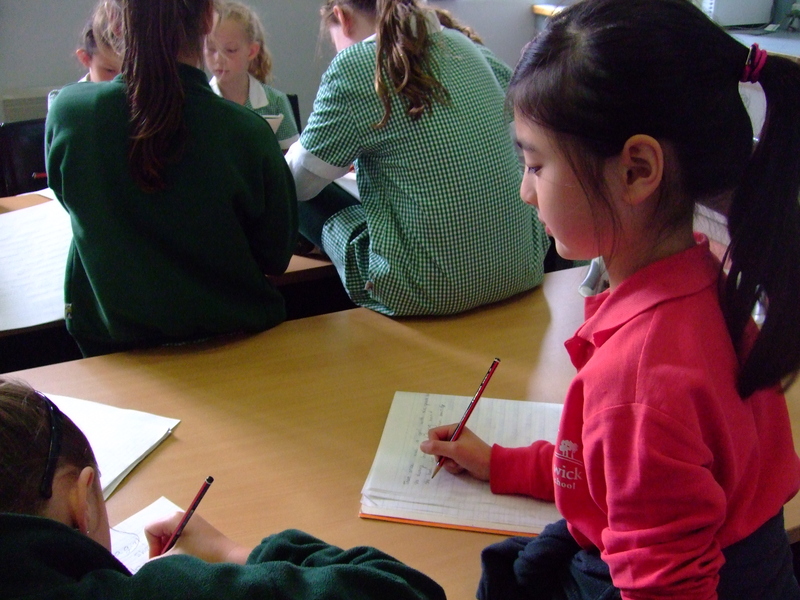 Therefore, throughout the Culture Jam project (my artist-in-residence project at Elsternwick Primary School in 2012) I included interviews with students as part of the ongoing project reflections, and filmed these interviews. I also gave them questions to consider and respond to in the reflective journals they wrote each week. These inclusions gave useful insights to me and the coordinating teacher throughout the project, but they also served as a form of student assessment. I’ve now finished editing that footage and you can watch it in the clip below. Head to my Youtube channel to see footage of the other compositions – their work in progress and their performances. To learn more from the vast experiences, expertise and wisdom of Arnie Aprill, you can pay a visit to his blog here, or via the Music Work blogroll. Term 4 2012 finished with flash mobs and slick moves at two of my schools last December. Searching for some straightforward choreography to teach some year 1 & 2 students I came across this dance video, uploaded as a tutorial for a flash mob in Milan in 2010. 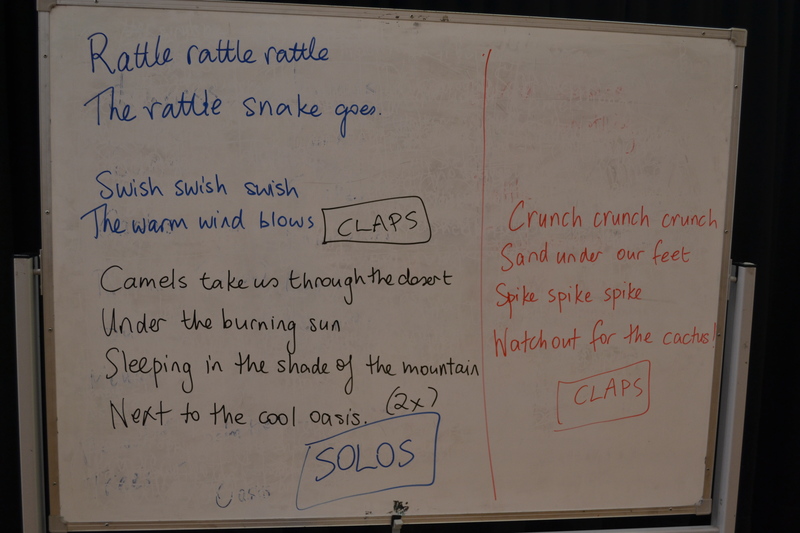 It was perfect – a song the students would already know and like (‘Waka Waka (This Time for Africa)” by Shakira), lots of repetition, simple steps, and a few more challenging moves that would keep them on their toes (excuse the pun) and give them goals to last across the 10-week term. I didn’t start with the intention of giving each of the dance moves a label. 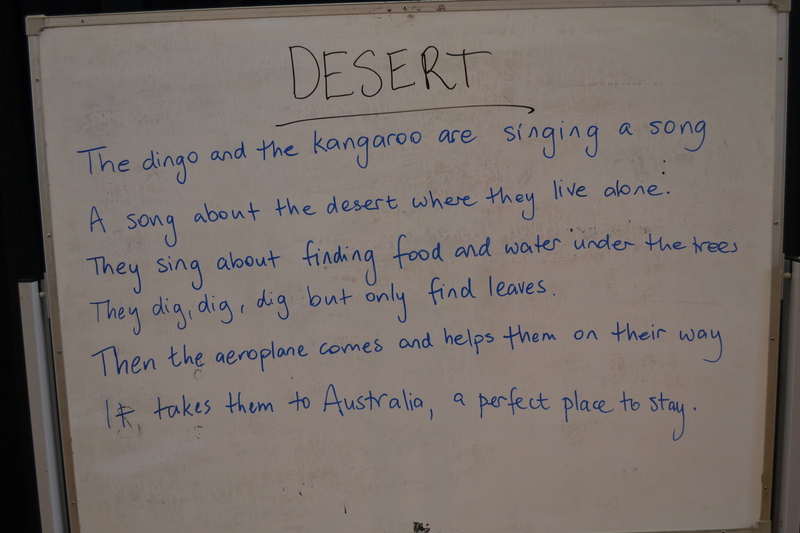 It was a spontaneous addition one week at the Language School to help the children differentiate between two different moves, but the labels proved so effective I soon included them in the lessons with the grade 1&2s at Pelican Primary School. I’d call the labels out in turn if we were running through the whole dance, or we would work on specific dance moves one at a time, identifying them by the given label. Check out “pick the fruit” at 0’31”, “up, up helicopter, down, down washing machine” at 01’15”, “clap clap shimmy back” at 1’07’’ in the video above! The labels also gave some of the more hip-swivelling moves an innocence and childishness. Thus, a twisting turn straight out of belly-dancing became more focused in the overhead arm movement, and was given the visual label of “lasso the cow!”, introduced via a description of cowboys catching cows by lassoing their horns, (see the move at 02’31’’). We worked a lot with the video tutorial. English language learners (especially some of those from refugee backgrounds) can spend so much of their time being only in the present moment, responding to the most immediate stimuli (or responding to the present while holding anxious thoughts about what might happen in the unpredictable future, or the past), and sometimes they struggle to retain sequences of information in their memories alone. Any kind of visual reinforcement is beneficial, and in the past I’ve used diagrams, stick figure pictures, grid scores and charts to map out how the individual components of a project that they have developed will fit together. Having a video is another way of doing this. It allowed the students to see the whole dance in its entirety. Right from Day One, they could see what they were aiming for. The video included both men and women – demonstrating that this was an activity for both genders (important when many of the students come from backgrounds where men’s and women’s activities are more delineated) and giving so everyone in the class a role model to choose and copy. It reduced self-consciousness and the potential for criticism of each other. They were so busy watching the screen and keeping up with the moves they didn’t have time to think about (a) what they looked like or (b) what anyone else looked like. It also gave the children a visual representation of how to stand slightly apart from each other in rows, or neat formation. Lots of children in Language School find the many variations of standing in lines (e.g. sometimes behind each other, sometimes beside each other, sometimes squashed close together, sometimes spaced apart, etc) quite confusing. Here is a back-of-heads view of the children at the Language School (all the primary school children) dancing to Waka Waka with me on my last day at the school for the year. If you’d like the full list of labels I used for this dance leave me a comment below and I’ll send it to you. 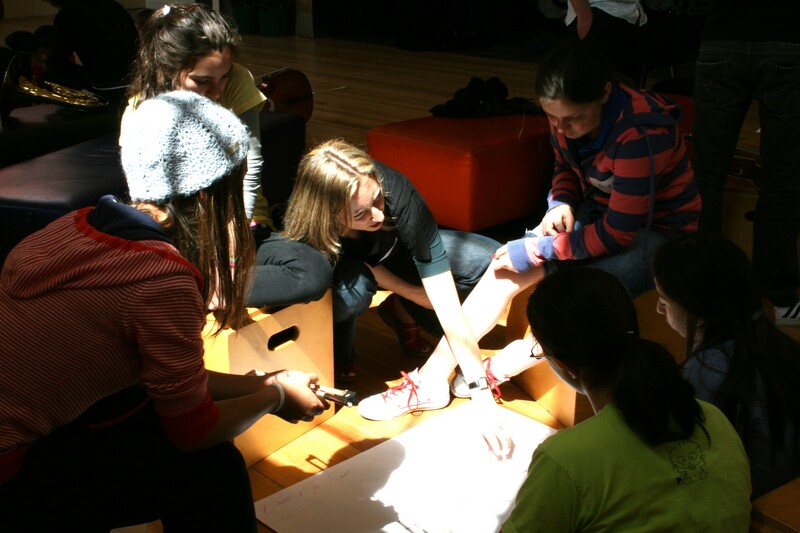 It’s interesting – and perturbing – to be reminded how early the self-criticism and judgement can set in when you are learning to play an instrument.”Can I play my saxophone today Gillian?” asked one grade 5 girl during this week’s City Beats workshops at ArtPlay. Of course the answer was an enthusiastic “Yes”, and she put her instrument together and set off with her small group to compose a short piece about leaves being whipped up by the wind (Melbourne has been very windy this week). When I came to see how they were going a short time later, she’d created a 5-note phrase, but she wasn’t looking all that happy about it. I asked her to teach it to me so that we could play it together (me on clarinet). Somewhere along the line, musical skills seem to have acquired a concerning status – that music is something you are supposed to be ‘good’ at, even when you are just starting. And if we think we are not ‘good’ at it, we ought to warn people, and apologise for our feeble efforts in advance. Does this judgement come from music teachers, or from other people in our orbit, people who are perhaps less tolerant of the sounds of a beginner? Or are we equally critical of our own efforts in all sorts of endeavours, as beginners or otherwise? Do we apologise in advance for our poor cooking (before we present a meal to someone), our poor driving (as we give someone a lift somewhere), our dreadful handwriting or poor drawing, our inability to tell a good joke? City Beats is part of the Melbourne Symphony Orchestra’s outreach program, so perhaps the student suddenly felt self-conscious that she might not be ‘good enough’ for the MSO. Being ‘good enough’ to participate in something is another common fear or self-applied assessment, and it is one that I am constantly trying to respond to in the Community Jams that I lead. For example, I make sure that the music we play is in a key that will suit beginners on any instrument – open strings, first notes on woodwind and brass instruments, etc. Otherwise, it can be a long time into a person’s musical life before they are considered ‘good enough’ to play in a large ensemble, and so they miss out on all the additional benefits and motivating factors of music as social life. For my young saxophone-playing friend, the most important thing is that she is enjoying playing, and that this enjoyment motivates her to continue playing so that she builds up her experience, knowing that skills and ability will be constantly growing. By the end of our 2 hour session on Monday she had mastered her melody and was playing it with great confidence. We’d added a dramatic trill at the end, and she played this with appropriate gusto. I caught her eye. “That’s a great sound you are making – look at how much improvement you’ve made in just this one session!” I told her. She beamed at me. She already knew. Back in May I wrote about The Reef education project that I led for the Australian Chamber Orchestra as part of the larger ‘Reef’ collaboration and tour. The project was documented by Chris Duczynski from Malibu Media and the following film made as an inflight movie for Qantas. Watching this video brings back lots of memories of what a great 3-day project it was! I was working with 35 highly enthusiastic and engaged young people, fabulously supportive teachers, wonderful ACO musicians and the added extraordinary versatility and talents of composer Iain Grandage and didg player and guitarist Mark Atkins – it doesn’t get much better than that.